​Napoli host Serie A's 11th placed side Sassuolo in the Coppa Italia round of 16 on Sunday, looking to claim their first title in this competition since 2014. Gli Azzurri were knocked out of the competition by Atalanta last season in the quarter finals, and Carlo Ancelotti will be hoping to lift the trophy he won with AC Milan back in 2003. Napoli are flying high in the Serie A this season, but with Juventus seemingly untouchable, will be looking for domestic success to give their fans something to cheer about. Being one of the top eight seeded clubs in the competition, this is the first time ​Napoli will have competed in this cup this year, joining at the round of 16 stage against a side who entered in the third round. Sassuolo had no problem overcoming Serie C side Ternana 5-1 in the third round before facing another Serie C side Catania, who the ​Serie A side scraped past 2-1, to set up Sunday's fixture against Ancelotti's side. Long-term absentees Vlad Chiriches has been out since September with cruciate ligament rupture and isn't expected back until March, while talisman Marek Hamsik is still sidelined with a thigh problem sustained last month. Ancelotti will have to freshen the squad up for the round of 16 tie, with three key players missing through suspension. Senegalese centre back Kalidou Koulibaly and Lorenzo Insigne were both sent off against ​Inter and face two-match bans, ruling them out of Sunday's encounter. Furthermore, central midfielder Allan is also suspended for accruing too many yellow cards. Sassuolo on the other hand, still have attacking midfielder Jeremie Boga out since October and not due back for some time, right back Claude Adjapong, who has been missing since fracturing his fibula in October. Other defensive issues facing Roberto De Zerbi is missing centre half Mauricio Lemos, who injured his thigh after Christmas. Napoli Ospina; Malcuit, Albiol, Maksimovic, Ghoulam; Callejon, Zielinski, Ounas, Verdi, Milik, Mertens. Recent encounters between the sides doesn't make great reading for Sassuolo supporters. They haven't beaten Napoli since 2015, although in the six matches since then, they have managed to draw three. They haven't been on the receiving end of hammerings by any means, however in order to progress in the Coppa Italia, nothing less than a win will do. The most recent meeting between the sides was on matchday eight of this season's Serie A. Napoli ran out comfortable 2-0 winners at home on that occasion, thanks to strikes either side of half time from Adam Ounas and Lorenzo Insigne respectively, with Rogerio been sent off late on for the visitors. Arkadiusz Milik's brace helped Napoli on their way to a 3-2 win over Bologna in their most recent outing, with ​Dries Mertens' 88th minute strike sealing their late win. Prior to that Napoli came up short away to Inter at the San Siro in a 1-0 defeat shrouded in controversy, with claims of racist abuse directed towards Koulibaly, while the Senegalese defender was also sent off along with Insigne. Their league form has been impressive this term, bettered only by the unbeaten Juventus, with their last defeat prior to the Inter game coming against the league leaders in a 3-1 defeat back in September. Sassuolo on the other hand, will be eager to banish any memories of their most recent match as they were demolished 6-2 at home to Atalanta, despite having more efforts on target than their opponents. Before Atalanta they came unstuck away and Roma, losing 3-1, and prior to that drew 1-1 at home to Torino, putting them on a three match winless streak heading into Sunday's clash. Here's how both sides fared in their last five games. 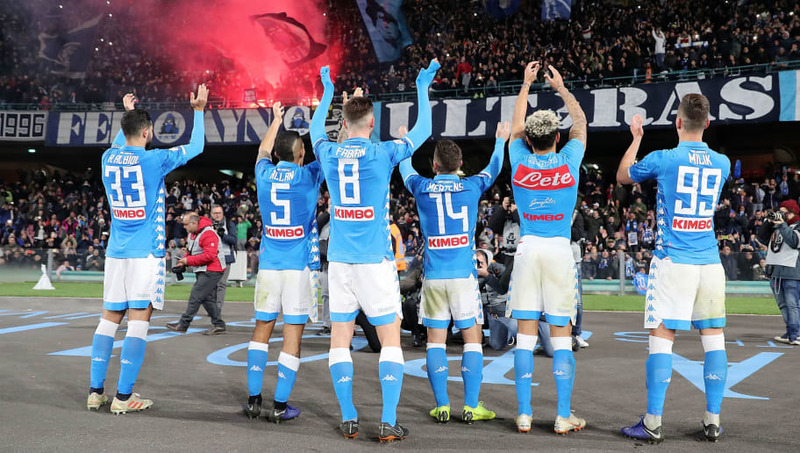 Despite missing players through a combination of suspension and injury, it would be difficult to see past Napoli making their way into the quarter-finals. Sassuolo are a team severely lacking in confidence after shipping six goals at home in their most recent outing, and could be put to the sword by the hosts. The visitors will make it tough for Napoli though, and will look to frustrate the west-coast side, however a win for Napoli looks the likely outcome.